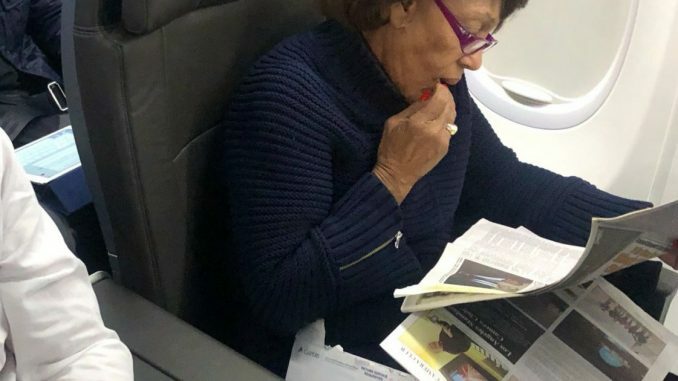 There’s nothing more elitist than a Socialist California Representative, who apparently doesn’t even live in the district she represents,flying in first-class reading about herself while people go without pay due to her self absorption. And we have the pictures to prove it. Despite the government shutdown, which has furloughed hundreds of thousands of federal employees (a lot of which are “non-essential”), California Representative Socialist Maxine Waters (D) was caught reading a newspaper article about herself (Narcissism, it isn’t just for Obama anymore) by The Daily Caller’s Benny Johnson. “HEY LOOK – It’s Maxine Waters sitting in First Class on my flight to DC during the government shutdown. Of course, Johnson pictured himself in the last row. That just means he is last to die if the plane goes down. While Waters claims she speaks for the people and has gone absolutely insane at the notion of impeaching President Donald Trump with no actual charges against him, she doesn’t seem to mind that some people in DC and other areas, including the one she allegedly “represents,” are going without pay. Nope, she is just content with first class and reading about herself. However, in front of the media cameras, she is a bleeding heart for furloughed employees. “Today is day 26 of the Trump Shutdown,” Waters said on Jan. 16, 2019. “Federal workers missed their first paycheck last Friday, and still there is no end in sight to this cruel and senseless shutdown. It is truly shameful that President Trump and Congressional Republicans are so desperate to secure taxpayer funding for an irrational border wall that they’re willing to harm hard-working Americans and jeopardize national security by shutting down the federal government. “TSA employees are dedicated public servants who risk their lives every day to keep our nation’s airports and travelers safe. On Nov. 1, 2013, a Transportation Security Officer named Gerardo Hernandez was tragically killed in the line of duty during an active shooter incident at LAX. He was the first TSA employee to be killed in the line of duty, and my colleagues and I passed the bipartisan Gerardo Hernandez Airport Security Act of 2015 in his honor. Our president has forgotten the critical role these American patriots serve in our national security. “Today, at LAX and airports throughout the country, Transportation Security Officers like Gerardo Hernandez are working without pay! The Trump Shutdown is endangering public safety, national security, and the livelihoods of the people whose job it is to protect us. “Democrats want to end this shutdown now. On Day One, the new Democratic House of Representatives passed Senate Republican legislation to end the Trump Shutdown and re-open [the] government. Despite the Republicans’ relentless obstruction, Democrats have continued to take further action to re-open [the] government, passing individual Senate Republican appropriations bills to re-open all government agencies. Now frankly, I wish the whole lot of the unconstitutional TSA Gestapo were unemployed, but this is the height of hypocrisy. Just remember this, Maxine Waters supporters, when she is up for re-election. She cares more about how she looks in public and her own creature comforts than she does your livelihood.